Huanglongbing (HLB) threatens the survival of the Florida citrus industry. 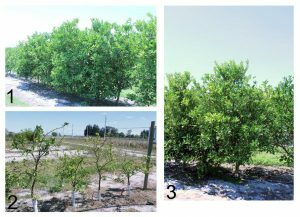 Both conventional cultivars and genetically engineered cultivars that can grow in the presence of HLB have been developed at the University of Florida’s Citrus Research and Education Center (CREC) in Lake Alfred. Among the two citrus improvement techniques, engineering citrus remains the fastest method for the improvement of an existing commercial cultivar and has been a key component in CREC’s overall citrus improvement strategy. In nature, plants are constantly attacked by pathogens; however, most attacks do not lead to infection. Plants resist getting infected with several invading pathogens by turning on their internal defense system, which is similar to the human immune system. This internal defense system is activated by a localized resistance reaction, which subsequently spreads throughout the plant. As a result, several protein molecules are produced inside the plant. These proteins, called the pathogenesis-related (PR) proteins, are ultimately responsible for preventing the invading pathogens from causing disease. The overall process of this immunization technique is called systemic acquired resistance (SAR). Engineered citrus, which can manipulate the way in which these PR proteins are activated, can potentially keep the plant primed against infection and effectively combat diseases. This mechanism of induced defense can confer long-lasting protection against HLB. Figure 1. (1) 5+-year-old transgenic trees expressing the NPR1 gene. (2) Non-transgenic control and susceptible transgenic lines in the second year after planting. (3) 3+-year-old transgenic trees expressing the NPR1 gene. This particular line is different from the one depicted in (1). Photos were taken in March 2017. The Arabidopsis (a mustard plant relative)-derived NPR1 gene plays an important role in priming the production and expression of PR proteins. This gene acts as a switch and aids in the activation of the PR proteins. CREC study has shown that citrus trees that are engineered with this gene have many activated disease-fighting PR genes. Currently, a population of engineered sweet orange trees expressing the Arabidopsis NPR1 gene is being monitored for resistance to HLB. Several transgenic lines have been observed to provide durable resistance against HLB. Several lines have remained HLB-negative for over five years, although they have been planted at a site with >95 percent HLB infection (see Figure 1). Unfortunately, these transgenic Hamlin plants also contain the green fluorescent protein (GFP). GFP-expressing plants cannot be commercialized currently, as the GFP gene has not yet been approved for human consumption (although it comes from jellyfish that are consumed by humans). Selected sweet orange cultivars such as EV1, OLL-8, Valencia, Vernia and others are being retooled to express the Arabidopsis NPR1 and protect trees against HLB. These new trees are being produced without GFP. Additional genes, such as the tobacco-derived SA-binding protein 2 (SABP2) or the citrus-derived β-1,3–glucanase (BG) gene, have also been inserted into citrus with promising results. The SABP2 gene is critical for the plant immune response; although BG is a PR gene, it may also reduce phloem plugging. Several transgenic rootstock lines expressing NPR1 have also been produced. These are now being grafted with commercial, non-GMO sweet orange scions for field-testing to determine if the improved tolerance can be transmitted to the scion. Gene stacking involves the expression of multiple genes in plants. Citrus is a long-lived perennial tree, and it is indeed possible that Candidatus Liberibacter asiaticus (CLas), the bacterium that causes the HLB disease, could mutate over time and become tolerant to the effects of a specific gene. This could result in the breakdown of disease resistance. Thus, the CREC team is engineering trees (scions and rootstocks) that contain two or more transgenes stacked in the plant that can back each other up. These plants are in the primary stages of evaluation, and their long-term ability to resist CLas is presently unknown. Figure 2. (1) A 16-month-old Carrizo rootstock tree expressing the juvenility-inducing FT protein in full bloom. (2) Close-up flowers. (3) Developing fruits on the transgenic line. Depending on the cultivar, citrus can remain juvenile for three to 10 years. This long juvenile phase hinders the evaluation of hybrids in the conventional breeding program as well as the engineered citrus developed from juvenile tissues. A reduction in juvenility can significantly reduce the assessment time for both, thus accelerating commercialization. Engineered Carrizo citrange rootstocks that flower within the first two years (Figure 2) have been developed. 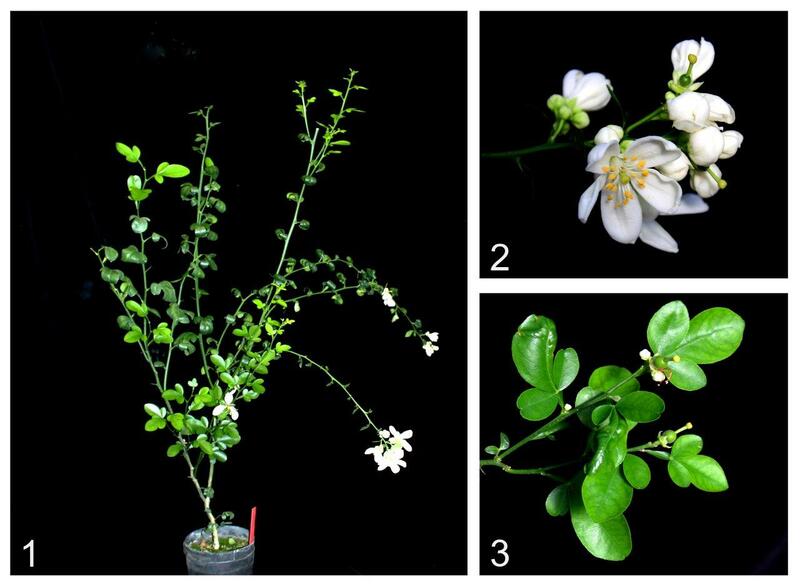 This was done by enhancing the expression of the citrus flowering locus T (FT) gene. FT has been implicated in the induction of flowering in many plants. Like the NPR1 described before, FT can also travel through the plant’s vascular tissues. The hope is that an engineered precocious rootstock can stimulate the above-ground scion to flower in a much shorter time than naturally possible. This would enable rapid cycling through the breeding population to identify select lines that can be subsequently evaluated on a larger scale. Moreover, it would aid in the rapid evaluation of the CREC-engineered lines. In a preliminary test, a juvenile grapefruit clone grafted to one of the CREC-engineered Carrizo rootstock lines flowered only in its second flush, which was an exciting development. All crop plants have evolved through the induction of mutations. Many navel orange and grapefruit cultivars are products of natural mutations. CRISPR/Cas9 is a tool that creates mutations in a plant’s DNA, but this process can be manipulated to occur much faster than that obtained through natural methods. CRISPR/Cas9 can target specific parts of a plant’s DNA and make necessary changes without affecting the rest of the plant. In citrus, there is a potential to create an HLB-tolerant plant using this technology. Citrus contains a native NPR1 gene that is not very effective in protecting against HLB. A primary issue preventing its expression is the presence of other genes that suppress the function of this endogenous NPR1 gene. The CREC research group has pioneered the cell culture and protoplast technologies that assist the endeavor to create targeted mutations in the citrus DNA. CRISPR/Cas9 technology is being utilized to target several negative regulators (proteins that suppress other useful proteins) of the SAR process and citrus NPR1 activity. It is expected that citrus plants would effectively combat HLB infection without the presence of these negative regulators. An added advantage is that these plants would be considered non-GMO (genetically modified organism), allowing for an easier commercialization process. To address public perception issues that arise from the utilization of bacterial or viral components in the engineered plants and to have a more consumer-friendly appeal, a system has been developed that utilizes all plant-derived genetic elements coupled with a visual selection system using a citrus-derived anthocyanin gene (replacing the GFP above). The process involving the development of engineered plants is highly dependent on the ability of the researcher to select the genetically engineered cells from the background non-engineered cells. Genetic markers such as the GFP are short pieces of DNA that visually indicate the presence of certain genes in an engineered plant. In contrast to the existing systems, a system has been developed that relies on the ability of cells to express anthocyanins in the initial stages of selection. This newly developed system also prevents the genetic marker gene from being expressed in the resulting engineered plants, but at the same time allows the expression of the beneficial gene(s) that allows the engineered plants to be protected from CLas. The CREC team has developed anthocyanin, overexpressing, purple Mexican limes as a proof of concept during the evaluation of the anthocyanin system as a genetic marker. (Purple margaritas are just a side benefit!) 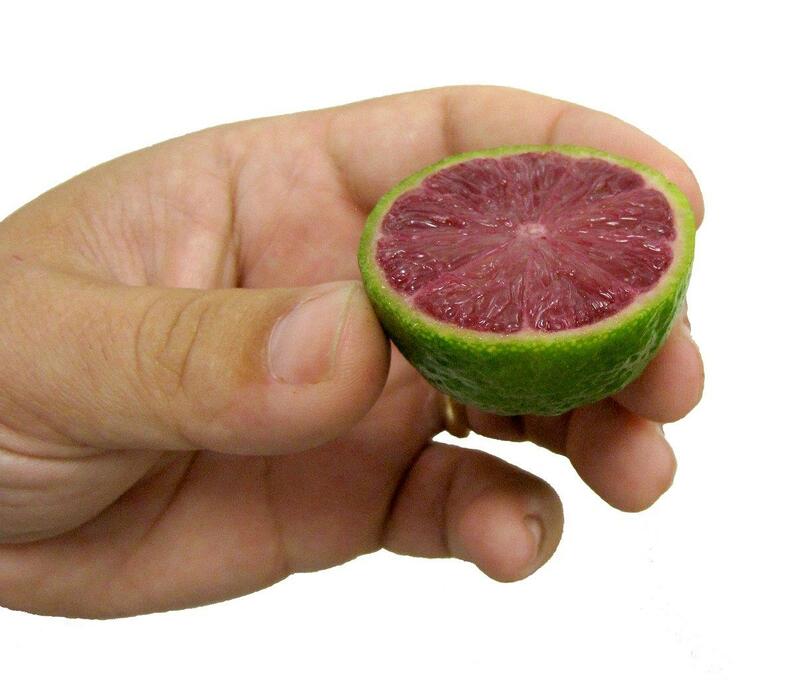 The tropical and subtropical citrus plants do not produce anthocyanins, with the blood oranges producing anthocyanins only after a prolonged cold chill. While blood oranges can be grown in Florida, they lack the intense coloration. Figure 3. A cross-section of an anthocyanin, overexpressing, engineered Mexican lime fruit. Anthocyanins are health-promoting compounds found in commonly consumed fruits such as blueberries, grapes and strawberries. CREC-developed plants offer proof that engineered citrus can result in the incorporation of an additional health-promoting component to the existing citrus portfolio (see Figure 3). IS GENETICALLY ENGINEERED CITRUS REALLY NEEDED? As with conventional breeding techniques, there are pros and cons to developing engineered citrus. Many believe that engineered citrus provides the best hope for a permanent solution to HLB. Several questions remain unanswered. Will these CRISPR/Cas9 induced mutations have the desired effect? Will the engineered plants hold up against HLB over time? Will the stacked gene-containing plants have a better effect than plants containing a single gene in the long term, such as after 10 years in the field? Currently, the answers to all these questions are unknown. However, the possibility of viable options can be predicted for future citrus plantings — including conventionally bred, engineered trees or a combination of both — in Florida. Current results give hope that research is well on its way to winning the fight against HLB. Manjul Dutt (manjul@ufl.edu) is a research assistant scientist and Jude Grosser (jgrosser@ufl.edu) is a research professor, both at the University of Florida Institute of Food and Agricultural Sciences Citrus Research and Education Center in Lake Alfred.